GigaDB Dataset - DOI 10.5524/100149 - Supporting data and materials for "NCBI BLAST+ integrated into Galaxy". 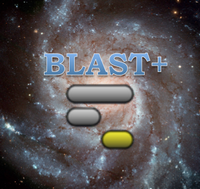 Supporting data and materials for "NCBI BLAST+ integrated into Galaxy". The NCBI BLAST suite has become ubiquitous in modern molecular biology and is used for small tasks such as checking capillary sequencing results of single PCR products, genome annotation or even larger scale pan-genome analyses. For early adopters of the Galaxy web-based biomedical data analysis platform, integrating BLAST into Galaxy was a natural step for sequence comparison workflows. Here we provide the command line NCBI BLAST+ tool suite wrapped for use within Galaxy. The integration of the BLAST+ tool suite into Galaxy has the goal of making common BLAST tasks easy and advanced tasks possible. This project is an informal international collaborative effort, it is deployed and used on Galaxy servers worldwide. Displaying 1-4 of 4 File(s).